Topeak quality and versatility. Super strong yet light tubular aluminium rack with integral top plate and triple stays. 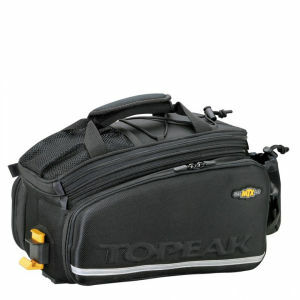 Integral Quick Track accepts all Topeak Trunk bags. 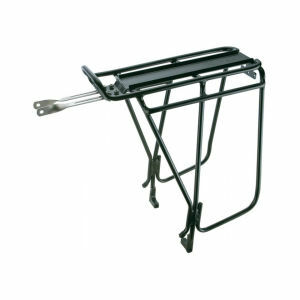 Extra side rail provides compatibility with most panniers when using a Topeak Trunk bag. 6061 T6 tubular aluminium construction and stainless steel fitting bracket. One size fits all frames. Great addition to the bike, no longer need to wear a back pack to work, more than adequate room for any items required and the bonus is the side panniers can be used if more space is needed. Great rack! It was easy to install and powder coating ensures that it won't rust. Tubes are hollow and one side came a bit bent from poor packaging from Probikekit but was pretty easy to straighten out. Just wish Probikekit would package their item a lot better. The Topeak Super Tourist is exactly what I wanted in a bike rack: sturdy construction & capable of hauling a significant load (max 66 lbs) On top of that, the Pro Bike Kit price was unbeatable. Everything about this purchase was a positive. Very glad to have this rack.